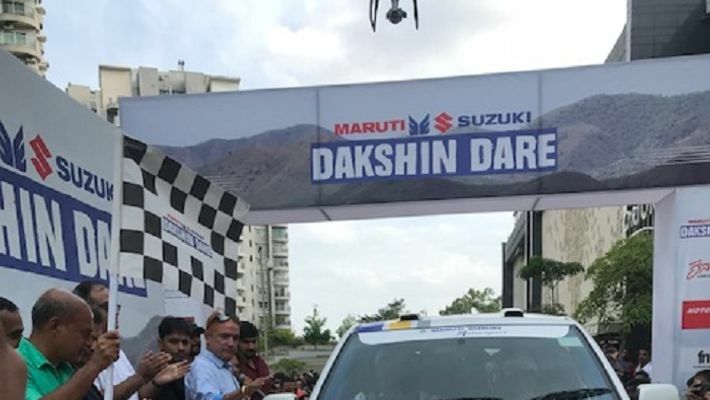 Bengaluru: India’s most celebrated rallyist Gaurav Gill and defending champion Suresh Rana are set for a spectacular showdown in the 10th edition of the Maruti Suzuki Dakshin Dare, which got under way here on Sunday (September 2). The 2,000-kilometre long rally, beginning in Bengaluru and finishing in Goa on September 8, will test every driver’s skill, speed and courage over five gruelling days and is expected to keep motorsports fans in the country hooked. South India’s most demanding and alluring rally will traverse through treacherous terrains in Karnataka and Maharashtra before entering the picturesque locales of the former Portuguese colony, where the eventual champion will be crowned. Gaurav Gill (Team Mahindra Adventure) has been in tremendous form and will be high on confidence after his stint in the World Rally Championship. A former winner here, he will relish this challenge, where he can be at his aggressive best over long stretches. Gill will also have the satisfaction of seeing two of his teammates in the fray, in the form of former national racing and rally champion Amittrajit Ghosh and Philiposs Mathai. Both are capable of making it their own show too, adding to the drama. Ten-time Raid de Himalaya champion Suresh Rana (Maruti Suzuki) will look to defend his title and give his team the coveted victory. He was at his sublime best in the recent Desert Storm too which should keep in good stead. Team Maruti is also well represented, with Sandeep Sharma and Samrat Yadav making it a formidable troika. Over 75 participants from different parts of the country will be seen in action, with Team Harjee Rallying capable of pulling off an upset or two too. Expressing his delight, RS Kalsi, Senior Executive Director, Marketing and Sales, Maruti Suzuki, said, "This year is very special for Maruti Suzuki as Dakshin Dare has achieved a historical ten year mark. What made a humble beginning a decade ago with only 20 competing teams, today stands with one of the most powerful and with 80 teams this season. We have seen an exponential rise in the women participants as they are ready to go shoulder to shoulder to showcase their skills behind the wheels. Maruti Suzuki has been persistently engaged in fostering innovation and excitement in motorsport. This year with the new rally route through Western Ghats, we are sure to offer an exhilarating experience to our participants." The 2018 Dakshin Dare officially began on Sunday, with the ceremonial start at the Orion Mall in Bengaluru. The competitors set off on their quest for glory Monday morning at five. The first leg will end at the Apoorva Resort in Davanagere, where the second leg will also be held on the subsequent day. The third and fourth legs will take place in Belgaum before heading to Kolhapur in Maharashtra. The final leg will see them leave Kolhapur behind and reach the Lalit Golf and resort in Goa for the grand prize distribution ceremony. The five special stages will cover over 600 km, making it one of the toughest and longest rallies in the country. The rally is being organised by Motorsport INC which is headed by Jaidas Menon has been the motorsport partner of Maruti Suzuki since a decade and have part of Dashin Dare since its inception.